24 and 26 October, the trial against two Swedish fishermen took place in a court of Gothenburg. 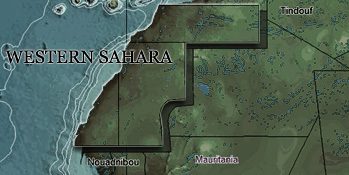 The two are accused of illegal fisheries in Western Sahara. "The Moroccans still abuse and exploit the Western Sahara natural resources”, stated a Saharawi that observed parts of the trial. Photo: Greenpeace activists chain themselves to Swedish fishing vessel that operates in occupied Western Sahara. The two Swedish fishermen Lennart Kjellberg and Ove Ahlström, and their two companies Fiskeri AB Nordic and Fiskeri AB Ganthi respectively, have been accused in a Swedish court for carrying out fisheries illegally in Western Sahara and Morocco in the period April 2007 to May 2008. Their two vessels, Nordic IV and Aldo, were according to the prosecutor missing relevant permission from the Swedish fisheries authorities. The missing permissions were said to be both for fisheries in accordance with Swedish and EU fisheries regulations. After several years of postponement, the court process finally took place on 24th and 26th of October. The sentence is scheduled for 23 November. The prosecutor said in the court that the fisheries is illegal, since it took place in a systematic manner, and in a large scale, during the 13 months in question. He further stated that the fisheries generated large profits, approximately 20 million Swedish kroners (2.3 mill Euros). The accused claimed in the court that they had in fact not been responsible for the fisheries in Western Sahara during this period, and drew up an intricate business structure to argue that someone else were the ones actually with the fisheries operations. 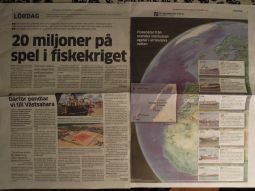 The Gothenburg Post, 20 Oct 2012The Swedes had, they said, rented out their vessels through separate bareboat charter agreements to the Moroccan fishing company Atlas Pelagic in Dakhla. This company manages the fisheries licences, as ship owners, something that the Swedes cannot do, they said. The fishermen said they had worked as instructors and consultants and have had the responsibility for the vessels, but nothing to do with the fisheries itself. The fisheries have, to the contrary, been carried out by a Moroccan crew of 7 to 8 people, they said. The payment that the Swedes have received from Atlas Pelagic was calculated out of the volume of fish sold from Atlas Pelagic’s fish processing factory and has thus varied. This income has been split in two equal parts between the two vessels. The defence thus claimed that the fishing permits were not needed since the Swedes did not carry out fisheries. The defence furthermore used arguments of changes in the EU legislation. The representative of Atlas Pelagic, Slimane Derham, who also attended the trial, stated in the interrogation that the Moroccan government had introduced a special programme in 2004, after the octopus fisheries had collapsed. This led to all fish having to be frozen for exports. In order to do this, new knowledge and RSW vessels were needed, something that Morocco did not have at the time. Thus, Scandinavian vessels came onto the scene. The Swedish vessels were rented with the purpose to educate Moroccan crews, it was stated. The programme was to continue for four years, after which the vessels would be reflagged to Morocco. The prosecutor stated that the fisheries were surely done by the Swedes, and that the charter agreement was irrelevant for the case. Bareboat charter agreements entail that the vessel is rented at a fixed price, not a fluctuating price depending on the volume of fish sold from the factory, he said. The penalty for an offence which the fishermen has been accused of is in theory prison, but the prosecutor only asked for a fine, since the accused are formerly unpunished and socially well established. Furthermore, the two companies would need to pay fees for the profits made during the two year period in question. The two accused fishermen claim today to be poor.